"True psychology (i.e. "the study of the soul") can be done only by Christians, since only Christians have the resources for understanding and transforming the soul. The secular discipline of psychology is based on godless assumptions and evolutionary foundations and is capable of dealing with people only superficially and only on the temporal level. [Footnote: Cf. the comments of a psychological counselor cited in Bobgan, PsychoHeresy 5-6.: "At the present time there is no acceptable Christian psychology that is markedly different from non-Christian psychology. It is difficult to imply that we function in a manner that is fundamentally distinct from our non-Christian colleagues."]. The Puritans, long before the arrival of godless psychology, identified their ministry with people as "soul work." Scripture is the manual for all "soul work" and is so comprehensive in the diagnosis and treatment of every spiritual matter that, energized by the Holy Spirit in the believer, it leads to making one like Jesus Christ. This is the process of biblical sanctification." - John MacArthur, THE PSYCHOLOGY EPIDEMIC AND ITS CURE (PDF). (This essay is adapted from Chapter 3 of John F. MacArthur, Jr., Our Sufficiency in Christ [Waco, TX: Word, 1991] 55-77). "But the natural man receiveth not the things of the Spirit of God: for they are foolishness unto him: neither can he know them, because they are spiritually discerned" (1 Corinthians 2:14). 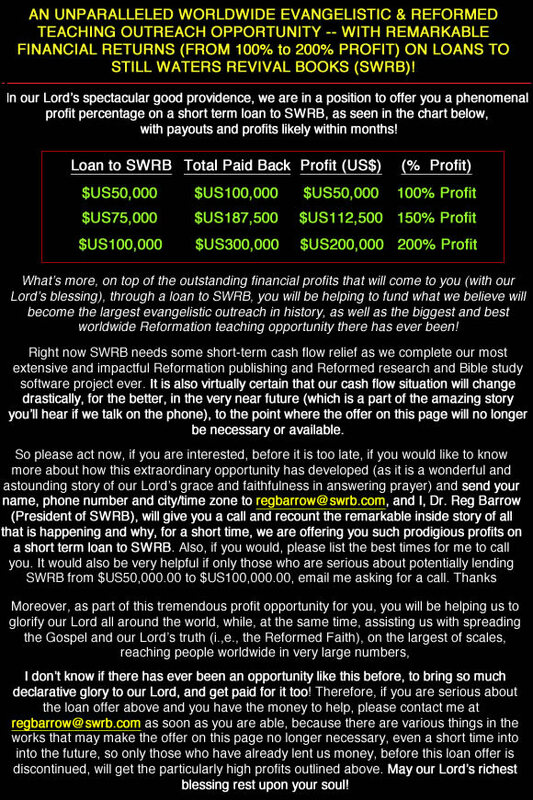 SWRB does not endorse everything believed by the authors or ministers in the resources listed in this email, but maintains that there is much of value in the articles, quotes, books and MP3s listed in regard to both secular and so-called "Christian" psychology -- and the detrimental effects they have on individual Christians and the church. Can Psychology Help You Solve Your Problems? For over a century, psychology has offered answers to people seeking help with problems of living. But are those answers reliable? A Former Industry Insider Wants You to Know the Truth. Drawing from years of experience in the field, Lisa Bazler evaluates the claims, beliefs and practices of secular and Christian psychology. She not only exposes fallacies and failures, but more importantly, she points the way to true healing and fulfillment. Whether you're searching for personal solutions, or know someone who needs help, this book offers practical and effective counsel based on sound biblical principles. Come and Discover the Overcoming Life. Know the true causes and cures of depression, anxiety, hyperactivity, addiction, family dysfunction and other common problems of living. Learn why secular and Christian psychotherapy, twelve-step programs and support groups aren't the answer. Understand the severe dangers of psychiatric drugs that your doctor doesn't tell you. Discover how the power of God can begin to transform your life today. Psychology Debunked -- the truth behind psychotherapy, mental health, depression, anxiety, ADD, ADHD, bipolar, self-esteem, Christian counseling, 12-step programs, support groups, Prozac, Ritalin, Paxil, Zoloft, Xanax, Klonopin, Ativan, Dexedrine, Adderall, Effexor, Luvox, Elavil, Pamelor, Valium, Dalmane, lithium, Depakote, Haldol, Risperdal, Navane, Clozaril, Zyprexa, disorders, addictions, diseases and illnesses. Former mental health professional Lisa Bazler and her husband Ryan sound an alarm to help seekers, exposing the true nature of psychology and its impact on the church. Readers discover shocking truths about psychotherapy, 12-step programs, Christian psychology and psychiatric medications. Readers also learn how the beliefs and practices of modern psychology differ from those of biblical Christianity. Why is it many evangelical preachers shout from the pulpit about God's power, but then shuffle their emotionally troubled members off to the closest therapist? Both church leaders and lay persons seem to believe that the psychological 'experts' have the answers for the wounded hearts and souls of God's people. And when churches do offer counseling, it often is tinged with the secular psychology and psychotherapy that have infiltrated the church. Psychobabble explains the dichotomy between secular and Biblical counseling and shows the danger of incorporating secular techniques into a Christian approach. This book will arm believers looking for Scriptural answers to the hurts of a broken world. As anti-Christian bias becomes increasingly pervasive in secular psychology, the church must look to the true source of all healing. This book will point the way. Dr. Ganz threads through all the sticky issues as he confronts the psychological demigods of the Christian integrationists' pantheon and exposes their feet of clay. For those who have wondered whether the integration of secular psychotherapy with the revelation of God in the Bible is possible--here is your answer. My goal in this book is to help readers understand that the counseling concepts woven into psychoanalysis (and its secular psychotherapeutic offshoots) are inherently opposed to the Word of God. My approach will be to reveal the direct conflict between secular philosophies and Biblical principles and to strip back to its ugly roots the psychotherapy that the church has baptized and embraced. My hope is that the church will stop shuffling her hurting and broken members to the 'experts' who lack the power and perspective of the Word of God, that pastors will instead seize the opportunities to teach, rebuke, correct, and train in righteousness a people fit for service to King Jesus. Richard L. Ganz, Ph.D., clinical psychology, previously served on the clinical psychiatry faculty at Upstate Medial Center in Syracuse, N.Y., and is an adjunct faculty member at Syracuse University. He also spent five years working with Dr. Jay Adams at the Christian Counseling and Educational Foundation in Philadelphia. He is now a pastor in the Ottawa Reformed Presbyterian Church and president of Ottawa Theological Hall in Canada. Click here for much more free information against psychology and other resources by Dr. Ganz. "Christian psychology" as the expression is used today is an oxymoron. The word psychology no longer speaks of studying the soul. Instead it describes a diverse menagerie of therapies and theories that are fundamentally humanistic. The presuppositions and most of the doctrine of psychology cannot be successfully integrated with Christian truth. In addition, the infusion of psychology into the teaching of the church has blurred the line between behavior modification and sanctification. The path to wholeness is the path of spiritual sanctification. It is foolish to exchange the Wonderful Counselor, the spring of living water, for the sensual wisdom of earth and the stagnant water of behaviorism. The Lord Jesus reacted in a perfect and holy way to every temptation, trial, and trauma in life -- the most severe ones that any human life could ever suffer. It should be clear that perfect victory over all life's troubles must be the result of being like Christ. No "soul worker" can lift another above the level of spiritual maturity he is on. So the supreme qualification for psychologists would be Christlikeness. If one is a truly Christian psychologist, he must do soul work in the realm of the deep things of the Word and the Spirit and not be following around in the shallows of behavior modification. Why should a believer choose to do behavior modification when he has the tools for spiritual transformation? This would be like a surgeon wreaking havoc with a butter knife instead of using a scalpel. The most skilled counselor is the one who most carefully, prayerfully, and faithfully applies the divine spiritual resources to the process of sanctification, shaping another into the image of Jesus Christ. - John MacArthur, THE PSYCHOLOGY EPIDEMIC AND ITS CURE (PDF). More books by Dr. Jay Adams on biblical counseling. Over 950 (8.5 inch by 11 inch) pages long, Dr. Timothy Keller calls this "the greatest manual on Biblical counseling ever produced." John MacAurthur writes, "We have long waited for a purely Biblical treatment of the spiritual ills and cures of men which is untainted by the views of psychology. Since Baxter lived about 200 years before psychology arrived, his deep work is completely void of its encroachment -- thankfully!" This book is also available on Puritan Hard Drive.